Felix As Good as it Looks Favourites Selection of Succulent Steaklets is a recipe which looks and smells so meaty, it is like you might have cooked it yourself. Specially prepared with tender meaty steaklets in a succulent jelly - it tastes so delicious that your cat will find it irresistible at every mealtime. 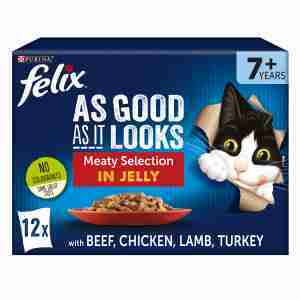 Felix As Good As it Looks Senior Pouch is specially formulated for cats over 7 years old. Did you know that an average cat spends about 40% of his life as a senior cat? While cats like Felix are far from average, Felix As Good as it Looks Senior pouches have been specifically formulated for cats 7 years and above. Although your cat may look the same at this age, his nutritional requirements have started to change. Felix As Good as it Looks Senior Pouches are 100% nutritionally balanced to help promote health and wellbeing for those going a bit grey around the whiskers. 12 x with appetising Chicken. 12 x with delicious Beef. 12 x with tasty Tuna. 12 x with savoury Salmon. Chicken Ingredients: Meat and Animal Derivatives (of which Chicken 4%), Vegetable Protein Extract, Fish and Fish Derivatives, Minerals, Derivatives of Vegetable Origin. Coloured with EC Additives. Beef Ingredients: Meat and Animal Derivatives (of which Beef 4%), Vegetable Protein Extract, Fish and Fish Derivatives, Minerals, Derivatives of Vegetable Origin, Various Sugars. Tuna Ingredients: Meat and Animal Derivatives, Vegetable Protein Extract, Fish and Fish Derivatives (of which Tuna 4%), Minerals, Derivatives of Vegetable Origin. Coloured with EC Additives. Salmon Ingredients: Meat and Animal Derivatives, Vegetable Protein Extract, Fish and Fish Derivatives (of which Salmon 4%), Minerals, Derivatives of Vegetable Origin. Coloured with EC Additives.